We enjoy supporting the creative and talented craftsmen and women on the Etsy marketplace. In January we purchased a batik Vanagon onsie from the seller, AppleJaxie. 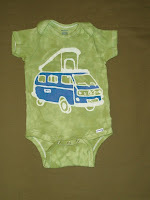 It finally fits Jacob, just in time for our upcoming road trip to Maine. 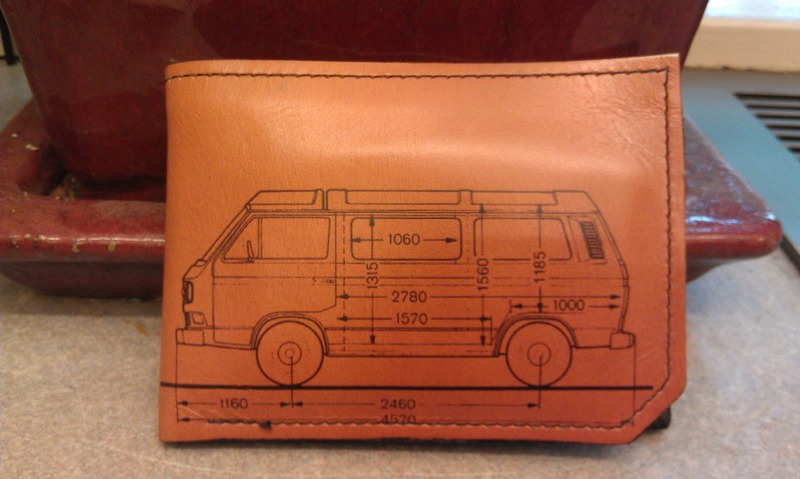 When my tattered wallet finally broke down a couple weeks ago, I turned to Etsy for a replacement. I particularly liked Backerton's handmade, full-grain leather wallets, which are thin by design but very functional. He prints a wide variety of old-timey images on the wallets, and while I liked many of the options, I had a custom design in mind. To my surprise, Backerton was willing to apply my image—a Vanagon blueprint, of sorts—at no additional charge. I'm very happy with the results! I'm considering making a t-shirt or hoodie with this same image, which took a good deal of effort to track down and a more time to print, scan, and enlarge. I'm now happy to share them with the Vanagon world. Both the profile and front/back images are available for download in high(ish) resolution. The blog limits the upload size, so contact me for larger versions. Last summer we enjoyed a 5-week, 9,000 mile cross-country road trip with our beloved dog, Parker. It's not an exaggeration to say the entire trip revolved around his needs. The presence of our furry family member determined where we camped, what activities we pursued, and how much continuous driving we could do at any given time. We don't have air conditioning in the Vanagon, but we made sure that Parker was comfortable, happy, and hydrated at all times. 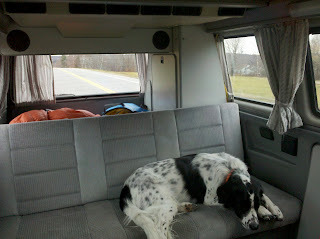 Regular stops to allow him to stretch and relieve himself were part of our daily road trip itineraries. If there was any possibility that these most basic needs could not be met, we would't have traveled with the dog to begin with. A happy road trip companion. Below you'll find a horrifyingly accurate infographic to illustrate how one should never take a canine (or any other animal) on a short or long-distance road trip. The story itself isn't breaking news, but the infographic sheds new light on its sordid details. 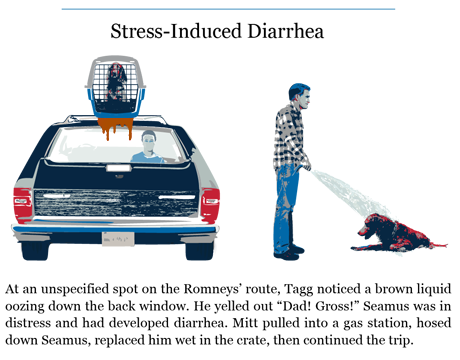 I'm still utterly disgusted by Mitt Romney's treatment of the family's Irish Setter, Seamus. Twelve long hours on the roof of the car in the summer heat on Interstate 90? 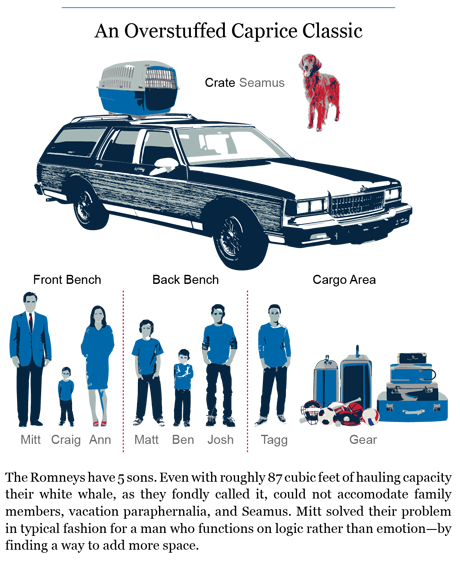 The infamous road trip occurred the same year that Romney left Bain & Company to co-found the private equity investment firm, Bain Capital. 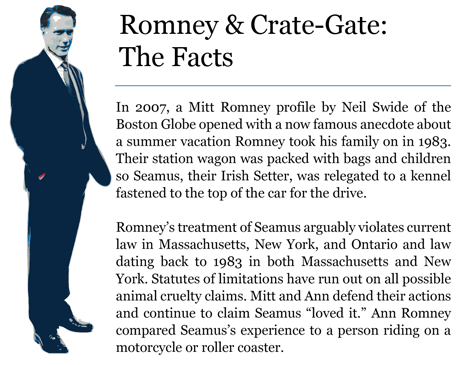 In other words, I'm sure he could have afforded a lovely, posh doggie spa or kennel for Seamus. Instead, he strapped him to the roof for a diarrhea-inducing ride of terror. Download a high-resolution version of this infographic for your blog or website. We finally got around to updating the Take a Tour! page on the site. If you've ever wondered what the heck a "pop-top" actually is, or how these vans could possibly sleep four adults, your questions have been answered with a comprehensive photo tour of our 1990 Vanagon Multivan interior.